I have always wanted to listen to old time radio shows on a console radio with the great sound. I did listen to some Kansas City Athletics baseball games in the late 50’s on my grandfather’s console radio. It was my first time to hear a major league baseball game on a radio. This is a console radio similar to the one my grandpa had on his Missouri farm back in 1959. I have always wanted to have a working radio like this but they are cost prohibitive. These radios came from another time but it was a special time when families gathered around their radios to hear such great shows as Gunsmoke, Amos and Andy, Jack Benny and Boston Blackie and many others. These were truly the good old days when a family would gather around the radio on a cold winter evening and listen to the great old time radio Christmas shows while snow was falling outside. The days of old time radio may have been gone for the last 47 years but those days will live on in the memories of those of us who remember those days. Even today these same shows can be bought at very nominal prices. I bought 360 Dragnet shows just recently for a total of $7.00. Televison may have caused old time radio to vanish from the airwaves as radio converted to an almost strictly news and music format. There have been some attempts to bring back old time radio but it never reached the popularity again that it had in the 30’s, 40’s, 50,s and the first couple years of the 60’s. 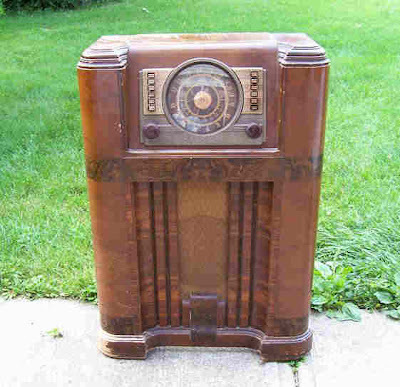 There were a few shows that went on the air in the 20’s but the sound quality on those shows is nothing compared to the technology of later years of old time radio when the sound was crystal clear. Gunsmoke which came to old time radio in the 50’s in an excellent example of how old time radio improved with the superb sound and the expert sound technicians who recreated the sounds of the wild west so we could enjoy the shows many years after the last gunfighter in the old west had retired. These trains brings back memories of the days when passenger trains were still on the tracks across the country. 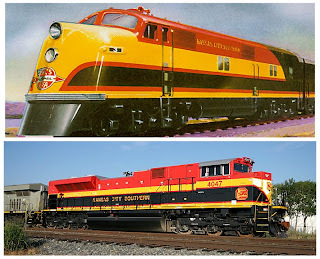 I remember the Southern Belle the best because of trips to Kansas City but also rode Missouri Pacific to Indianapolis to report to my new post at Fort Benjamin Harrison on a snowy day in January of 1963. I can remember in 1962 when my high school graduation present was a train ride by myself to Kansas City, Missouri to see a baseball game. That trip was 47 years ago but I can remember it like it was yesterday. I boarded the train in Alexandria, Louisiana in the afternoon and the next morning the train arrived in Kansas City, Missouri. I can still remember some of the stops along the way like Texarkana, Texas, Sallisaw, Oklahoma, Neosho Missouri, Joplin, Missouri and Grandview, Missouri which was close to Kansas City. After a long night of traveling it was good to finally arrive in Kansas City after about 17 hours of traveling from Louisiana to Missouri. 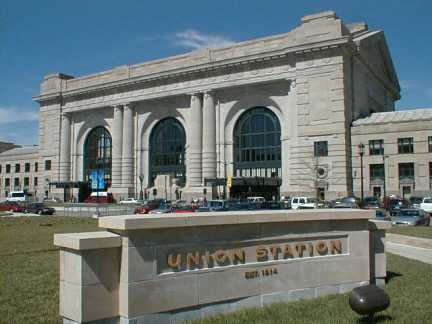 Union Station in Kansas City, Missouri which was built in 1914 and was at the time the second largest train station in the United States. While I in Kansas City I got to see the New York Yankees play the Kansas City Athletics in a doubleheader. I can remember Hall of Famer Whitey Ford losing a 16 hitter which I think was a complete game. The highlight of the doubleheader was seeing both Mickey Mantle and Roger Maris hit home runs. Only a year earlier Maris had set the single season home run record when he hit 61 homers and Mantle had hit 54 that year. In a few days I boarded the train for the return trip to Louisiana and wish today I could make another trip on a passenger train but passenger trains mostly are in bigger cities now. Still the memories of that train ride will always remain.